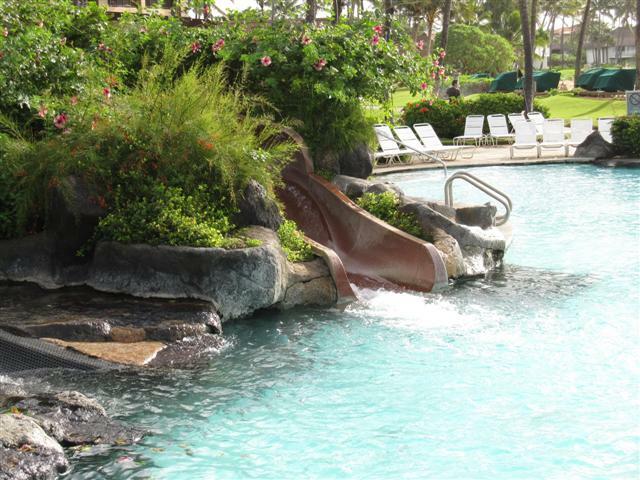 We spent one week at the Sheraton Kauai. It’s about a 25 minute drive from the airport to the Sheraton. At checkin, we were pleasantly surprised to find out that because of all the problems we’d had in Maui, we got a free upgrade from a partial oceanview (which as it turned out would have been across the road in the garden side, not even at the main building!) to a deluxe oceanfront. The room certainly earned its name – this was a beautiful room, with a fantastic view of sunsets every night. 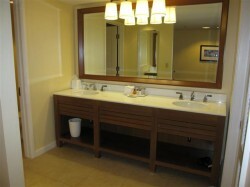 The decor was very nice, the bathroom was large, with a huge counter. 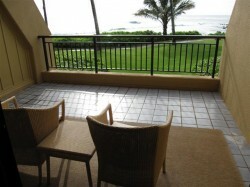 The lanai, even though we were only first floor, had a great view of the ocean and the palms swaying in front. This is what we came here for! 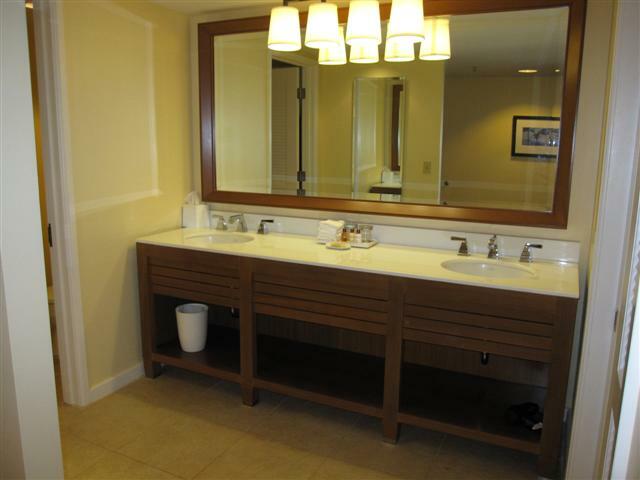 Unlike Maui – we had no problems with the room at all, except for a fridge that (3 fridges later) they swapped. We listened to the surf every night for a week as we fell asleep. The grounds themsleves, were also quite in contrast with Maui’s. 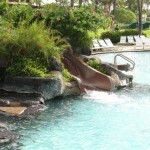 The pool was rather simple, although there was two levels and a waterslide, it was fairly basic. It needed to be redone – tiles were cracking everywhere. The loungers around the pool were the cheap plastic kind, and many of them were very dirty, even first thing in the morning – obviously they weren’t cleaning them. In general. 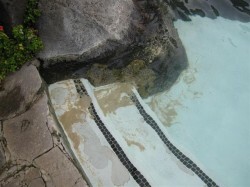 the pool area was not being maintained properly. We even came down one morning to find beer cans littering the area around the whirlpool – obviously no one had cleaned it from the previous night. When Ian told the pool staff, their reaction was a flippant “Ok” instead of a “I’m so sorry Sir, we’ll take care of that right away” which is what we would expect from the Sheraton. The pool itself was also often dirty – again, even first thing in the morning we would find straws washed up on the sides. Sand was collecting on the bottom of the pool, as well as the whirlpool. After seeing how dirty the hot tub water was one night when the jets weren’t turned on, we decided not to go in it any more – but it was certainly concerning given the number of little kids we saw splashing around and dunking their head in the water. The atmosphere around the pool was not always family friendly. The stretch of beach that the Sheraton sits on is one of the most popular beaches in Kauai. By law, all beaches are public, so there was many, many people not only on the beach, but around the pool who were not Sheraton guests. We heard a lot of language that was not family appropriate, and we a couple of pretty rowdy drunk groups in the whirlpool at night (while the barstaff were all too happy to keep serving up the Mai Tai’s). Sand in the pool - We never saw anyone cleaning anything. Ever. 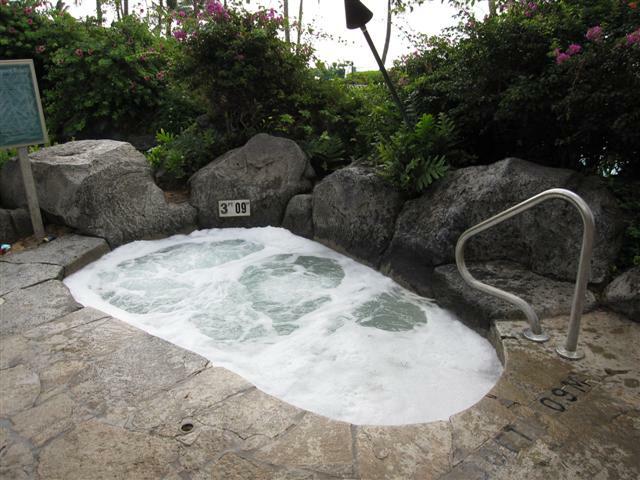 Hot tub / Whirlpool - notice beer cans litter at corner. This is the sight we got when we first arrived one morning - they didn't clean it overnight. Hot tub / Whirlpool - notice beer cans litter at corner. This is the sight we got when we first arrived one morning - they didn't even bother cleaning overnight. What time of year were you visiting? 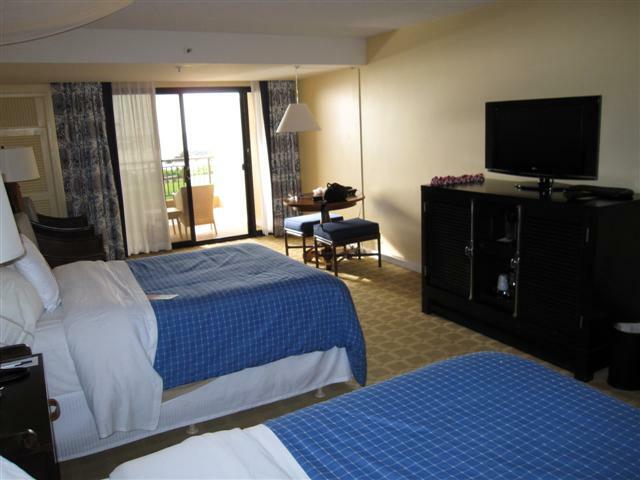 I’m going there in a couple weeks and i wonder if i need to reconsider the hotel choice we made…. We were there over Christmas. Hope that helps! Enjoy your vacation!